give you a taste of my world. This movie is about a fictional high school, Herrington High School, at which the faculty and staff are taken over by alien parasites. In turn, the faculty then infects the students with the organism. 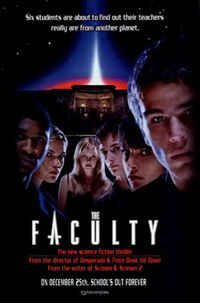 A group of six students resist, including: Zeke Tyler, a loner; Stan Rosado; Stan's girlfriend Delilah Profit, a popular, yet vindictive girl who is the editor in chief of the student paper; Casey Connor, Stokely 'Stokes' Mitchell, a female outcast and Marybeth Louise Hutchinson, the new girl at school, who came from Atlanta to live with relatives because her parents died in a car crash. The aliens who take over the school do so by injecting a parasitic organism into the ear, which takes over the brain and creates what appears to be a different version of the person - one that desires to spread the parasite as much as it can. The faculty sends the entire student body to the nurse, Rosa Harper for ear inspections, where they are taken over by the parasite. Before this, however, Casey has figured out their plot, and he warns Delilah, Stokely and Stan. Joined by Zeke and Marybeth, who overhear them talking of aliens in the science lab, they are all convinced of Casey's theory when Mr. Furlong, the science teacher, enters the room and attempts to infect them with the alien. Zeke pulls out a pen filled with his drug, and jams it into Furlong's eye, which then dries out the alien inside of him, as the drug is a diuretic and the aliens require water to cope with life on Earth; an older teacher made a poor host as she lacked the necessary water for the alien to exist. They all leave the school, which has become completely infected, and go to Zeke's house with a sample of the parasite, where they verify that Zeke's drug is diuretic/desiccant and dries the alien out. Stokely speculates that destroying the queen alien will kill all the parasites, without killing their victims. Soon, the group becomes suspicious of each other. They test each other by taking the drug and when Delilah's turn comes, she refuses, revealing that she had already been infected. She then destroys most of Zeke's supply of the drug, as well as his equipment for producing it, before getting away by bursting through the wall. The remaining five, with what is left of the drug, go to the school, where the entire town is watching the school football game. They succeed in killing Principal Drake, but the other hosts remain unaffected. Stan subsequently becomes infected when he goes onto the field to investigate. Because they ran out of their supply of the drug, Zeke and Casey decide to go to Zeke's car for more. Marybeth and Stokely wait inside the school gym for their return. While Casey serves as a decoy, Zeke goes to his car. There, he encounters Miss Burke, who is infected; he decapitates her by driving into a bus, though she survives and reattaches her head. At the same time, Marybeth reveals herself to be the queen alien by changing into a large aquatic creature; when snorting the drug, she blocks up her nostrils and tipps out the drug while everyone was distracted by Delilah. Casey returns before Zeke, and he and Stokely must run from the transformed Marybeth. Zeke returns with more of the drug, only to find that Stokely, too, has been infected. After confirming that Casey remains human, the two of them try to fight Marybeth in the locker room, but Zeke is knocked out, leaving only Casey. In an attempt to talk Casey into surrendering, Marybeth delivers a speech about how she crashed onto Earth, came to their school, found all of them alienated and unhappy, and started infecting them in order to create a better life for the entire world, one of harmony and acceptance, and then attempts to seduce him by appearing naked. Casey rejects her advances, running through the back of the gym's bleachers after triggering them to collapse against the wall, and the alien (having chased him) becomes trapped. Casey then stabs the drug into her eye, killing her.